Hi there! Welcome to the final day of Sneak Peeks for Jaded Blossom Sneak Peek week!! Tomorrow is the big day where you can get your hands on this YUMMY new release!!! Today Jaded Blossom is featuring Turkey Poop, and Happy Owl-oween! 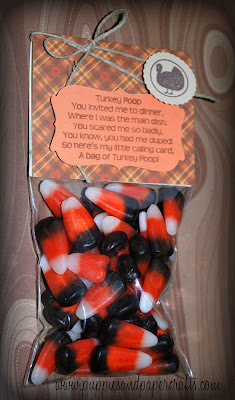 Here is a cute bag of Turkey Poop!! 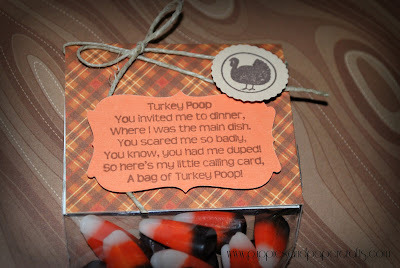 I used the 3 by 4 inch bags, Curly Die, Turkey Poop Stamp Set, and Thanksgiving Kisses for today's treat! Stop by the Jaded Blossom Blog for more Sneaks and inspiration! Stop by tomorrow for the Stamp Release Blog Hop!! I am so excited to share my project with you! Its my favorite one so far!! Eek!! Ok! Come back tomorrow lol! So cute love the colors of the candy corn. Teehee how fun. Love these stamps.